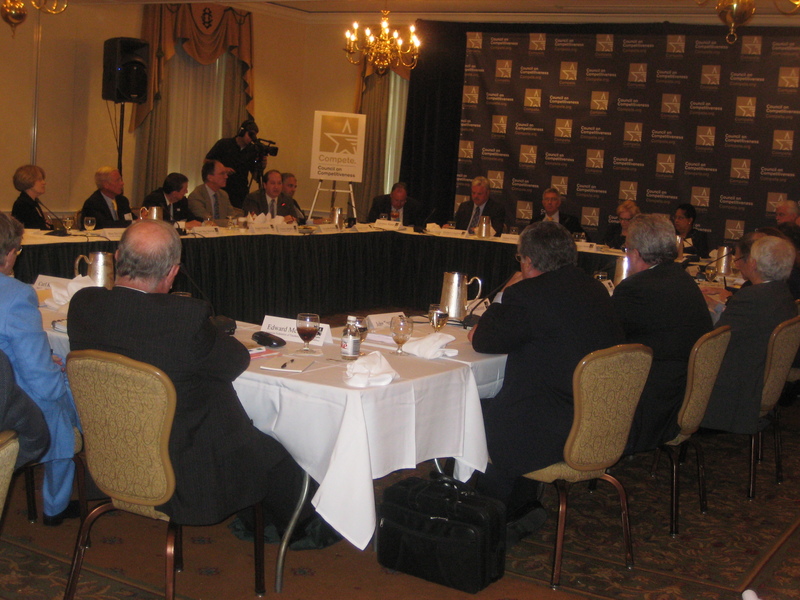 Council on Competitiveness Blog | The Council on Competitiveness is the only group of corporate CEOs, university presidents and labor leaders committed to the future prosperity of all Americans and enhanced U.S. competitiveness in the global economy through the creation of high-value economic activity in the United States. Dr. Shirley Ann Jackson presenting the CoC's 100-Day Energy Action Plan in a speech at the National Press Club. Today, Council on Competitiveness’s (CoC) Shirley Ann Jackson, Ph.D., Vice Chair of the Council and President of Rensselaer Polytechnic Institute, presented the CoC’s 100-Day Energy Action Plan in a speech at the National Press Club. The plan was designed to guide the next president and Congress on how the U.S. can achieve energy security, stimulate energy innovation and job growth, and protect the environment. The plan was devised by more than 200 corporate CEOs, labor leaders, university presidents and other energy experts. View the C-Span video. Photo of Dr. Shirley Ann Jackson, president of Rensselaer Polytechnic Institute and Vice Chair of Council on Competitiveness (CoC), and co-chair of the Council’s energy initiative. The Council on Competitiveness will release its 100-Day Energy Action Plan for the next administration and Congress at a National Press Club Luncheon September 9. Shirley Ann Jackson, university vice chair of the Council and co-chair of the Energy Security, Innovation and Sustainability (ESIS) Initiative, will deliver the luncheon address. The Council began to develop this plan more than a year ago with the guidance of more than 200 CEOs, university presidents, labor leaders and energy experts. Long before the urgency and political charge that surrounds the energy debate today, the Council recognized that energy security is a competitiveness issue that is directly linked to America’s productivity and standard of living. The initiative, which is a result of the recommendations in the Council’s seminal report in 2004, Innovate America, is led by Dr. Jackson and her fellow co-chairs, James Owens, CEO of Caterpillar, Inc.; and Michael Langford, National President of the Utility Workers Union of America, AFL-CIO. America’s future global leadership and economic growth hinges on our ability to implement a comprehensive national strategy for increasing energy security, innovation and sustainability. The Council’s plan offers solutions to provide affordable energy for businesses and individuals, produce domestic jobs and protect the environment. Seating for this event is limited. Please visit National Press Club Online for ticket information. 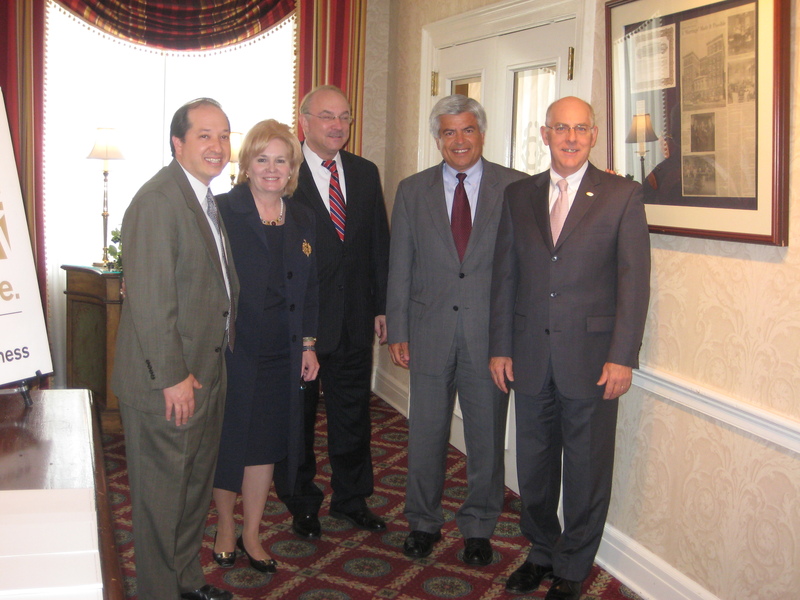 From left to right: Andy Karsner, Assistant Secretary at DOE; Deborah Wince-Smith, President of CoC; John Mizroch, Principal Deputy Assistant Secretary at DOE; Dan Arvizu, Director of NREL; and David Rodgers, Deputy Assistant Secretary at DOE. Other participants that joined today’s steering committee meeting were Assistant Secretary Karsner from the Department of Energy and Larry Weber of Racepoint Group. Mr. Karsner praised the work of the ESIS as one of the most important initiatives from one of the most influential groups. The conversation that ensued discussed the previous election between Bush and Kerry, specifically how energy was only brought up once. Everyone was in agreement how things had changed in a few shorts years. Discussion then moved onto the importance of creating incentives so that the private puts more money into developing renewable energy and technology that boosts efficiency. A rich discussion is taking place at the CoC’s ESIS Initiative Steering Committee meeting. Many leaders are offering their viewpoints on the future of energy from the Former President of Shell, John Hofmeister, to Thomas R. Baruch, Founder and Managing Director of CMEA Ventures. There was also a focus on the world wide shortage of skilled workers to build and operate the next energy generating technologies be it fossil or renewable fuels. As one member put it, everyone supports a green workforce, but neither the Obama or McCain campaign has a comprehensive plan to create it. ESIS Steering Committee Convenes This Morning! Photos of Washington D.C. where today's meeting is being held. This morning the Energy Security, Innovation & Sustainability (ESIS) Initiative steering committee is convening with top advisors to the Obama and McCain campaigns along with senior officials in the U.S. Department of Energy in Washington, D.C. In her opening address to the members of the steering committee, which is made up of top CEOs, labor leaders and university presidents, President of the CoC, Deborah L. Wince-Smith said, “Energy is the most important issue moving forward to ensure the future competitiveness of the United States. Lives updates will be provided directly from the meeting throughout the day. Manufacturers face a growing challenge. Even though the old adage of the factory floor as dark, dirty, and dumb has given way to the new reality of safe, sanitary, and smart facilities, many manufacturing intensive regions now face a labor shortage. Most manufacturing firms that survive have invested in productivity-enhancing technology instead of more labor. Jobs in manufacturing now pay more and are less physically demanding. But while there is less need for manual labor, the increased need for technology-savvy laborers is increasingly hard to meet. There is little reason to doubt that talent will continue to drive both individual and regional economic prosperity. According to the U.S. Employment and Training Administration, 26 of the 30 fastest growing jobs over the next ten years in the United States will require at least some post-secondary training. Between 2004 and 2014, approximately 46 percent of all job growth is expected to be generated in professions (management, technical, high level sales) that require a college degree. For the highest-paying jobs, an even greater percent will require college training. With no end in sight to the technological advances that enable the growth of knowledge based industries, the need for skilled workers in unlikely to abate. Even entry level jobs will require basic knowledge of computer skills. Higher level jobs throughout the economy will require significantly more capabilities, from technology comprehension to advanced management techniques to manage globally dispersed workers. As the U.S. baby-boomer generation retires and more global regions upgrade their ability to support high-value added industry, U.S. metro areas will find the competition to retain highly skilled workers intensifying. As we look to the future, it seems increasingly clear that the level of education in the workforce will be the difference between regions that succeed and those that stagnate. Energy is the defining challenge and economic opportunity of our time. The competitiveness and economic growth of the United States hinge on our ability to craft and implement a comprehensive strategy for increasing energy security and sustainability. In an age of competing global demands for energy and unstable sources of supply, our prosperity is linked to the kinds of energy we use and how efficiently we use it. The economic toll of the exponential increase in global demand for energy has rippled across our economy, adding to the cost of doing business and squeezing the pocketbooks of ordinary Americans. Securing access to energy supply, increasing the nation’s energy productivity, maximizing the economic value of each unit of energy consumed and minimizing environmental impact – each of these issues must be addressed if the U.S. is to remain competitive. To ensure our leadership in the global economy, we must act now. Energy security cannot be achieved without a comprehensive national strategy. This certainly includes reducing U.S. dependence on foreign oil, but an energy strategy must encompass more. Redundancy of supply and diversity of source are essential if the U.S. is not to be overly dependent on any one energy source or supplier in the marketplace. The match-up of appropriate energy source to sector of use must be optimized – whether supplying energy to heat homes, to transport goods, to light cities or to power enterprises. Each of these elements must be supported by innovation: technological innovation, policy innovation and innovative global collaboration. To date, key energy issues have been almost entirely absent from the presidential debates, even though energy is a driver of U.S. competitiveness in the global marketplace and is a key focus of business enterprise worldwide. There has been little discussion about the role of government in creating the environment for progress in energy security. There has also been limited debate about how to create the conditions necessary to stimulate innovation in the energy arena, or about the steps necessary to ensure an adequate energy workforce to meet the needs of the 21st century. We represent a cross-section of private sector leaders – from business, labor and academe – who see the tremendous potential for the creation of new energy markets, technologies, industries and good jobs ahead if we properly harness our resources. The economic boom that would accompany these energy advances would drive our economy for a generation. Our institutions and companies are already acting to capitalize on and shape these opportunities. U.S. competitiveness by addressing these energy challenges. By way of this letter, we share with you proceedings from our initial dialogue in Define. The Energy-Competitiveness Relationship. But we cannot do it alone. We urge you to use the power of your candidacy and your office to communicate and act upon the tremendous urgency, economic opportunity and national importance of transforming the U.S. energy system. We ask that you assign the highest priority to creating the enabling conditions that will stimulate the investment and innovation required for a sustainable and secure energy future. Meeting our global energy security needs will only be possible with strong national leadership and a solid base of public understanding and support. Toward that end, we invite you to join with us in working to elevate the national discussion on these critical energy issues. We have outlined three key questions which we welcome your comment on in the remainder of the primary and general election cycles. We are committed to guiding our nation on a path toward a more secure, sustainable and competitive energy future. By harnessing our national innovation capabilities, we can continue to drive our economic growth and enhance the standard of living for this and future generations. We welcome you to consider us as a resource in this undertaking.